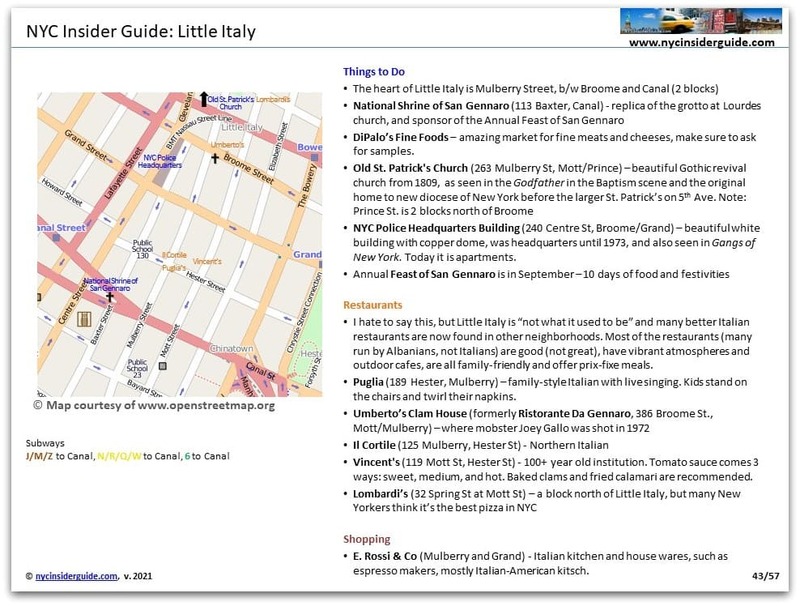 Little Italy NYC is a small, but very densely packed area of shops and restaurants. It is best to just walk around and enjoy the culture. DiPalo’s Fine Foods – amazing market for fine meats and cheeses, make sure to ask for samples. NYC Police Headquarters Building (240 Centre St, Broome/Grand) – beautiful white building with copper dome, was headquarters until 1973, and also seen in Gangs of New York. Today it is apartments. 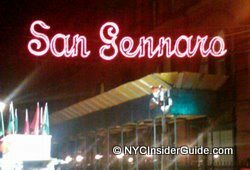 If you’re looking to compare every slice of Pizza in NYC, or have a ‘sausage, onion and pepper’ sandwich, San Gennaro, held every September, is the festival for you! 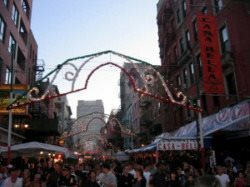 Although it is an annual celebration of faith, the Feast of San Gennaro has a huge variety of ethnic food delicacies, charming restaurants and cafes and even a world-famous cannoli-eating competition! Ahoy New York Food Tours takes locals and visitors alike on a cultural walk of Chinatown and Little Italy. Taste delicious foods, while learning about the culture and history of these unique New York City neighborhoods. Eat ethnic foods, like homemade fresh mozzarella and authentic Chinese dumplings, while seeing some of New York City’s hidden gems and historical landmarks. All NYC Insider Guide visitors receive 20% off tours with our special discount code at Ahoy New York Chinatown and Little Italy Food Fest Tours! I hate to say this, but Little Italy is “not what it used to be” and many better Italian restaurants are now found in other neighborhoods. Most of the restaurants (many run by Albanians, not Italians) are good (not great), have vibrant atmospheres and outdoor cafes, are all family-friendly and offer prix-fixe meals. Puglia (189 Hester, Mulberry) – family-style Italian with live singing. Kids stand on the chairs and twirl their napkins. Vincent’s (119 Mott St, Hester St) – 100+ year old institution. Tomato sauce comes 3 ways: sweet, medium, and hot. Baked clams and fried calamari are recommended. E. Rossi & Co (Mulberry and Grand) – Italian kitchen and house wares, such as espresso makers, mostly Italian-American kitsch.